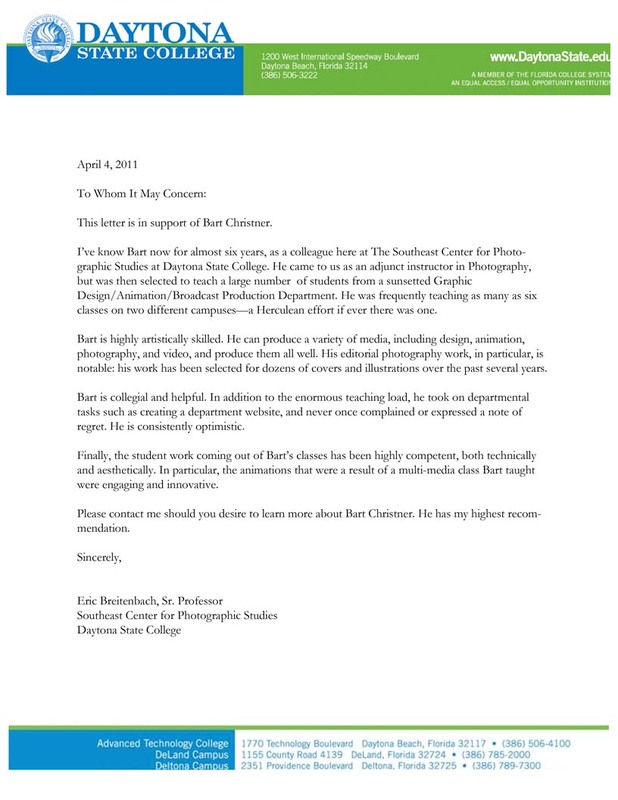 This letter is in support of Bart Christner. I’ve know Bart now for almost six years, as a colleague here at The Southeast Center for Photographic Studies at Daytona State College. [Our department's committee hired Bart, as a full-time, tenure-track Associate Professor] in Photography, but he was then selected to teach a large number of students from a sunsetted Graphic Design/Animation/Broadcast Production Department. He was frequently teaching [more than] six classes on two different campuses—a Herculean effort if ever there was one. Bart is highly artistically skilled. He can produce a variety of media, including design, animation, photography, and video, and produce them all well. His editorial photography work, in particular, is notable: his work has been selected for dozens of covers and illustrations over a the past several years. Bart is collegial and helpful. In addition to the enormous teaching load, he took on departmental tasks such as creating a department website, and never once complained or expressed a note of regret. He is consistently optimistic. Finally, the student work coming out of Bart’s classes has been highly competent, both technically and aesthetically. In particular, the animations that were a result of a multi-media class Bart taught were engaging and innovative. Please contact me should you desire to learn more about Bart Christner. He has my highest recommendation.